Since launching the new Ontario Women’s Justice Network, the Community Justice Program team has been busy working on new legal information resources for diverse women. SEXUAL ASSAULT AND CONSENT: Our very popular infographic on the law of sexual assault and consent has been updated! View and download it here. MEDIATION: We have developed a new infographic on mediation. This one will help you learn more on mediation as a way of solving your family law issues outside of court. View and download it here. IMMIGRATION LAW: We have added a new article that highlights a recent change in Immigration Law: the removal of the Conditional Permanent Residence rule for sponsored spouses/partners. If you were given Conditional Permanent Resident status, or if you recently applied for a spouse/partner sponsorship, this article is important for you. OLDER WOMEN FACING PARTNER ABUSE: In partnership with Elder Abuse Ontario, METRAC’s Legal Director co-facilitated a webinar on safety planning for older women facing abuse. You can find it here. 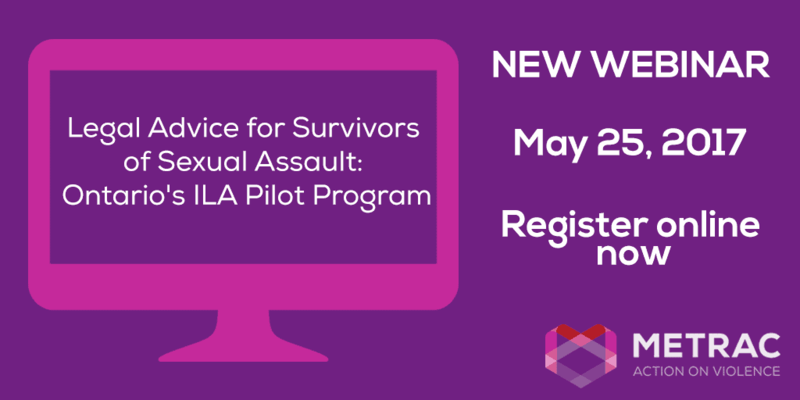 Don’t forget that we have a May 25 webinar on Ontario’s Independent Legal Advice (ILA) Pilot Program for Sexual Assault Survivors . This webinar is presented in partnership with Community Legal Education Ontario (CLEO). There is still time to sign up! Find out more information here. A reminder to follow our social media channels for the latest METRAC programs and events updates.